Sentiment indicators such as consumer and business confidence, stock market indexes, and surveys from trade organizations such as the Institute of Supply Managers have hit highs not seen in several years. 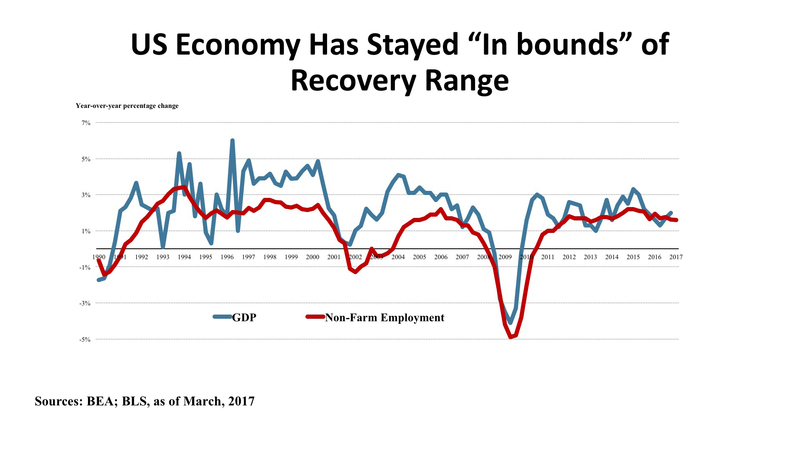 However, most “hard data” measures have stayed stubbornly within the bounds that have characterized most of the recovery period since the Great Recession. Real consumption actually declined both in January and February. Industrial production is up just 0.4% year-over-year, as of figures released late last month, although it was utilities rather than manufacturing that showed weakness. Government press releases notwithstanding, the trade deficit is right in the range it has been since 2010. All told, then, the Blue Chip Economists’ forecast is for a meager 2.2% expansion of real GDP in 2017, followed by a scarcely better 2.4% in 2018. Jobs. As this newsletter has been discussing for some time, demography has collaborated with the economy in putting steady downward pressure on the unemployment rate. The “headline” rate hit 4.5% in the Bureau of Labor Statistics’ most recent tally, the lowest level since 2007. There has been a saw-toothed pattern of net job growth, however, as hiring has confronted reduced slack in the labor force. We should not make too much of the comparatively weak job gain in March (98,000), but the year-over-year employment numbers have been stuck in the 2.2 to 2.4 million range for six months now, and the percentage increase March 2016 – March 2017 was just 1.5%. The numbers are hinting that the employment cycle might have peaked as early as January 2015 for this recovery. If “jobs, jobs, jobs” is the prescription for real estate demand, as for the economy as a whole, close attention to this Spring’s BLS reports is clearly warranted. Policy. The expectation that the new Trump Administration would capitalize on its “First 100 Days honeymoon period” to advance a policy menu of lower taxes, less regulation, an infrastructure boom, and healthcare reform has met with decidedly mixed results. Executive orders have indeed loosened regulatory constraints, and a strongly stimulative Defense Department budget will provide a boost to many parts of the country (see this issue’s map for detail, and the regional economic discussion below). But the American Health Care Act fizzled without making it to a Congressional vote – hobbled by opposition from both the right and left, and doomed by a Congressional Budget Office analysis showing as many as 24 million losing coverage. Tax reform will not be easier (it never is). The infrastructure outlook depends upon appropriations that seem wholly dependent upon the budget implications of the as-yet uncertain tax bill. Monetary policy, meanwhile, appears to be on a long-awaited course of Fed tightening in a move away from the zero-interest-rate bound of 2009 – 2016. Policy coherence remains in short supply, in other words, and may remain so until some spirit of compromise arrives in Washington. Outlook. The consensus of Blue Chip Economists for moderate growth in the range of 2.2% - 2.4% in 2017-2018 is actually slightly weaker than three months ago. Unemployment is expected to stay low, but inflation is now expected to edge upward and exceed the Fed’s two percent target, and possibly rise above 3% briefly during 2017. Wages can be expected to tick upward under these conditions, and households’ disposable income would improve. Bond rates will be rising – increasing business borrowing costs and constraining investment. And home mortgage interest rates will likewise increase, taking some steam out of the housing recovery. So the outlook is mixed, but risks to the downside are increasing. The Atlantic Seaboard is punching above its weight, and that’s impressive for a region that is already an economic heavyweight. Early 2017 indicators point to generally tight labor markets. With the exception of West Virginia, all states in the East experienced job expansion in the past 12 months, with total regional job additions numbering 926,100, just over 40% of the national total job increase. Florida, Georgia, and Maryland are growing statewide employment significantly faster than the U.S. as a whole. Metro areas in the Southeast – including Atlanta, Charlotte, and Charleston – are posting strong gains, as are the I-95 metros from Boston, through New York and Philadelphia, to Washington, DC. More subtle workplace indicators, such as a trend from temporary to permanent employment, increased wages, and labor supply shortages in IT, accounting, and healthcare have also been noted in Federal Reserve reports from the region. If there are weaknesses to be noted, they are sporadic. Retail sales volumes have generally been sluggish. International tourism destinations, most notably Manhattan and Washington, DC, are seeing some softening in hotel occupancies due to a combination of a strong dollar and the now-suspended travel bans introduced soon after President Trump’s inauguration. Such weaknesses have been more than balanced by employer optimism, acceleration in manufacturing activity, and even a record volume of container shipments at several ports. As we noted in the January edition of this newsletter, the East is likely to see a disproportionately high level of economic stimulus with the proposed $54 billion increase to the Department of Defense budget. 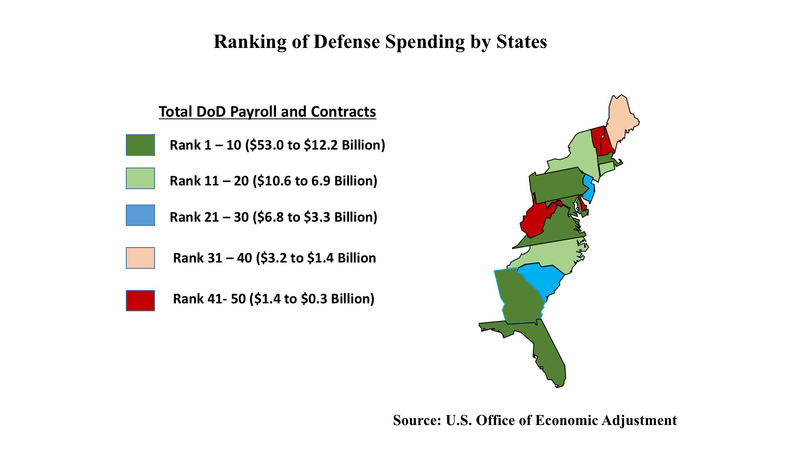 Five of the states in the region (Virginia, Maryland, Florida, Georgia, and Massachusetts) rank in the top ten for military spending, including both total payroll and contracts. All together, the states on the Atlantic Seaboard represent an enormous 43.5% total of all defense expenditures, with states like Virginia, Maryland, and Connecticut vastly surpassing the U.S. average on military expenditures per resident. In summary, the East Coast is enjoying what might be termed “late cycle prosperity.” With post-Global Financial Crisis slack almost fully taken up, the challenge ahead is to sustain growth without overheating while at the same time working in an environment of rising interest rates. Unquestionably, this is a much better challenge to face than what began to become visible in the Spring of 2007, just a decade ago. 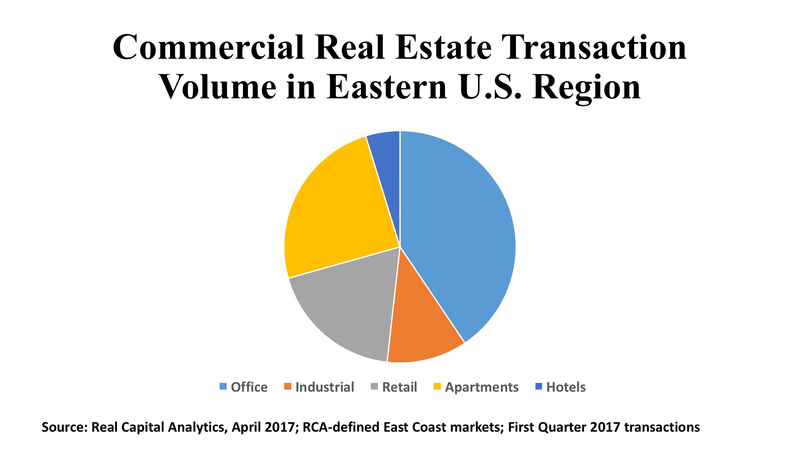 The trend of declining commercial real estate investment volume noted in past newsletters continued through the First Quarter of 2017, both nationally and along the East Coast. The year 2015, it appears, stands as the high water mark for this investment cycle. For the first three months of 2017, markets along the Atlantic Seaboard tallied $31.3 billion in aggregate purchase price. For the past 12 months, transaction volume across five property types (office, retail, industrial, multifamily, hotel) is down 18.6% in the region. This decline is twice as steep as the 9.3% drop for the nation as a whole over the same period. Office. Offices captured the highest share of investment volume in the Eastern region over both the most recent three-month and twelve-month horizons, well ahead of the runner-up apartment sector. The office markets on the Atlantic Seaboard tallied $12.7 billion during 2017’s First Quarter, a remarkable 47.4% share of total US office investment volume. This region posted $60.5 billion in commercial office investment in the twelve months ending March 2017. This amounts to a 43.9% capture rate vis-à-vis the nation. Manhattan is still the most active market, with $6.5 billion in transactions this quarter, followed by Boston ($3.9 billion), Washington ($1.8 billion), Charlotte and Northern Virginia ($1.3 billion apiece).Private equity investors represent the greatest share of purchaser capital (33%), followed by international investors (29%) and institutional investors (25%) in 2017Q1. Industrial. Atlanta topped the East’s industrial property volume with $846 million in purchases over 98 individual properties. 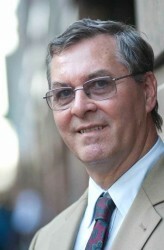 Northern New Jersey ranked second, with 34 deals totaling $520 million in price. All told, First Quarter 2017 industrial sales along the East Coast combined for $3.5 billion invested in 318 properties. The region therefore accounted for 27.2% of the national industrial investment total in early 2017, roughly in line with its 25.1% capture rate for the 12 months ending March 2017. The median cap rate was 7.0%, about 30 basis points higher than national standard for the sector. Private equity investors represented 45% of the buyers this quarter, nearly double the 23% share held by institutional investors. REITs, owner-users, and Canadian purchases divided the rest of the pie pretty evenly. Retail. Shopping properties in the Eastern region broke out of the negative trends afflicting most other real estate investment sectors this quarter. The January-March 2017 quarter saw 402 retail deals totaling $5.9 billion, up 39.5% from the prior period and a hefty 35.1% share of all US retail property dollar volume in early 2017. This was a nice step up from the region’s 28.1% share of retail investment for the twelve months ending March 2017. The East’s median cap rate of 6.2% was 30 basis points lower than the national norm. No doubt the regional totals were influenced by the $737 million in New York’s “outer borough” markets and the $715 million directed toward Manhattan shopping assets. But the highest investment total was in Florida’s Broward County (Ft. Lauderdale), where 31 transactions generated $779 million in aggregate price. While private equity claimed the greatest share of buyers at 46%, REITs were not far behind with a 36% capture rate.